Due: article summary on Frank Bruni’s “Measuring a College’s Value” — Sunday Review section, page 3 — bring it in digital form, emailed to yourself, or on your laptop; we’ll need the digital version so that we can post them to your Digication site. Here’s my example. Due: #1: post your revised initial, first summary in précis form, and keep both versions; we want to be able to see your original summary and the revised version, in précis form. Here’s one possible organizing principle for that. 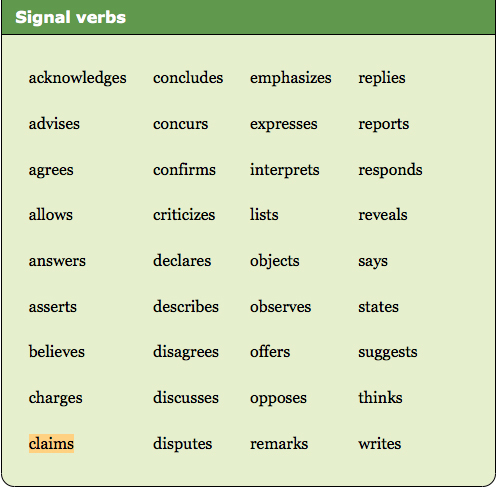 13b ”Working with quotations”; note how some of the signal verbs are rhetorically active verbs (“claims”) and some are not (“says”). Can you tell the difference? Samples. 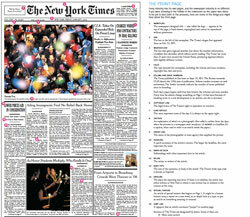 For class discussion, we’ll focus on p. A1 and the Sunday Review section — come prepared to discuss. Tuesday, 9/22 In class: For class discussion, we’ll focus on p. A1 and the Sunday Review section — come prepared to discuss. Page One: Inside the New York Times — no longer on Netflix, but is available via Hulu and Amazon Prime — free trials are available for both. In class: NYT as assigned; Brooks: The American Idea and Today’s G.O.P., which we’ll use as a test case: if we were going to write a rhetorical analysis of this essay, how would you do that? Due: Rhetorical Analysis, Final Draft; by Friday at 5:00 p.m., add your project reflection to the bottom of your final draft, like this. Due: Op-Ed inquiry question & your 500-word exploratory essay; yellow-highlight your best, or most interesting, or most compelling, or most intense sentence. Post your SoundCloud link to Digication. Due: Remix “draft” #1 — can be messy & rough — photo, sketch, etc. Portfolio workshop and editorial feedback You can work on your portfolios during this time; we will problem-solve any technical or organizational issues; and we will discuss editing and visual, logistical coherence. Section 133: Thursday, 11/19, 11:30-1:45 P.M.